Bacon is not the enemy. Sweet potatoes are not annuals. Actually, these could be used as slogans on message clothing. I would particularly like that. Sweet potatoes and yams are the perfect food. My mom would tell you it was my first food. Have you ever looked at their nutritional value? They are high in potassium, low in fat, high in vitamin A, and they have water soluble fiber. But sadly, sweet potatoes and yams are essentially sidelined and dismissed pretty much the entire year. Then when the end of the year brings the holiday season, they become ubiquitous, unable to escape our attention, imagination or desire. Their holiday usefulness is fairly limited. We candy them in brown sugar and butter; craft them into a custardy pie; or whip them up into a casserole and plop marshmallows on top of them. After the holidays, they fade into obscurity. And bacon, it’s just plain maligned and yes even loathed. The cultural and religious tenets and folklore about pork are endless, and I think that is what’s at the center of the disdain. But cooking pork or bacon properly and completely is essential as it is with any meat or foul. That’s just basic food and health safety. 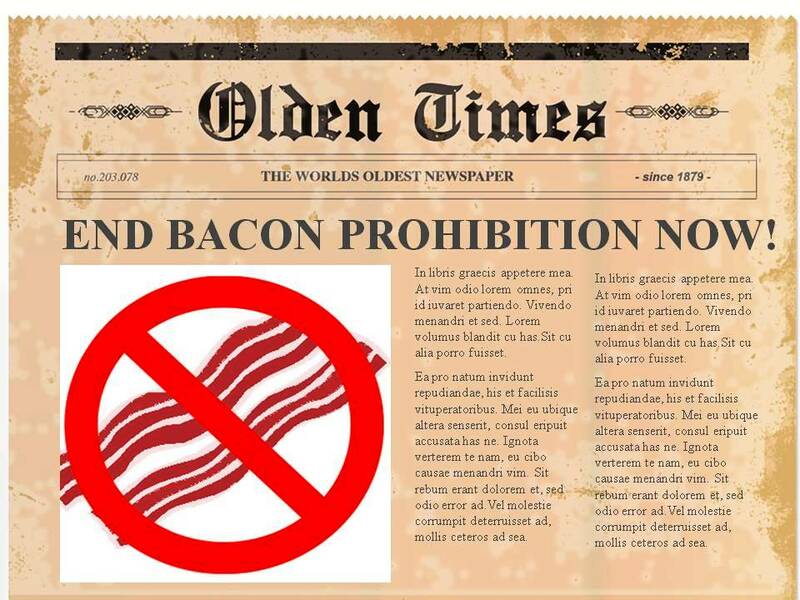 I’ve been around former bacon enthusiasts who became bacon prohibitionists. Yes they try to proselytize me by telling me how bad pork is and the nitrites used in curing pork products are carcinogenic. As they yammer over my tasty, smoky, glistening strips, I see their bacon envy and the love hate relationship they have with their forbidden. I shall not be moved. Let those in agreement say, “Amen.” Now, pass me another strip please. It’s been said over and over again, everything is better with bacon. Just a little goes a long way it terms of adding flavor. It gives food a depth and richness unlike anything. 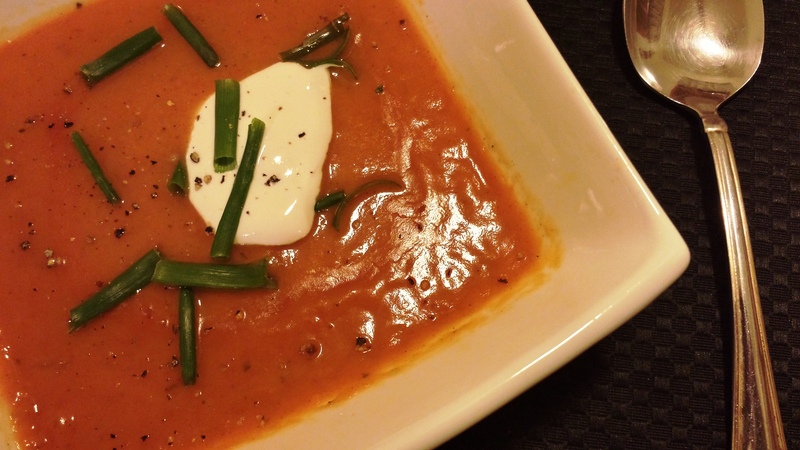 Pair bacon with sweet potatoes or yams using my simple and savory Sweet Potato and Applewood Bacon Soup recipe and your soul will be soothed by its delicate and mildly smoky notes. This recipe uses uncured apple wood bacon, for those concerned about nitrites. The use of fresh oregano, grated nutmeg and cinnamon make the soup warm and earthy. The addition of Crème Fraiche makes it taste decadent. No prohibition here – just a perennial favorite I couldn’t wait to share. Peel sweet potatoes and cut in about 1 inch cubes. Add cubed sweet potatoes to a large pot filled with 8 cups of water and 1 teaspoon salt. Bring to a boil and cook 10 minutes. Drain and set aside. Cook bacon in a non-stick skillet until done. Remove bacon from skillet and set aside on paper towel to drain. To the bacon drippings in the pan add parboil sweet potatoes, chopped onion, red bell pepper, garlic and fresh or dried oregano. Over medium heat, sauté 15 minutes, stirring constantly until sweet potatoes are fork tender. 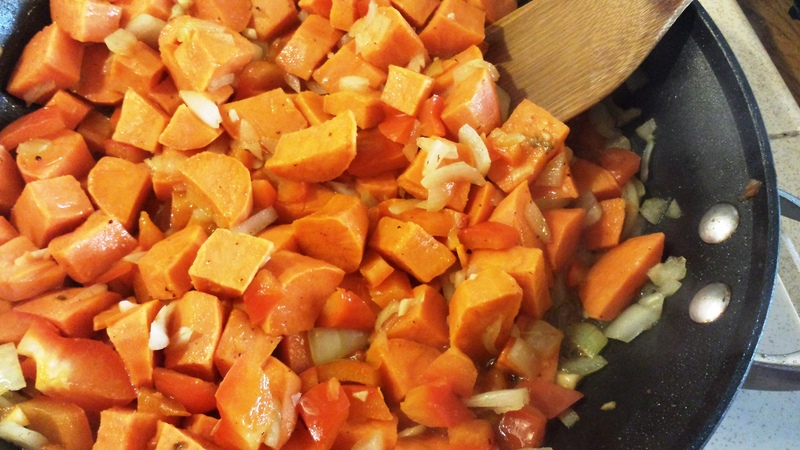 Remove from heat and add sweet potato sauté mixture to a large pot or Dutch oven. To this mixture add chicken stock, 1 teaspoon salt, nutmeg and cinnamon. Bring mixture to a gentle boil, turn down heat and simmer for 30 minutes, stirring occasionally. Remove from heat. Insert an immersion blender into pot and puree the mixture, using short pulses, until creamy. Or carefully transfer the mixture into a blender or food processor. Puree until smooth. Return to the heat. Crumble cooked bacon and stir into soup. Ladle soup into a bowl. Serve with a dollop of Crème Fraiche and fresh chopped chives. Note: you can substitute Greek yogurt or sour cream for Crème Fraiche. However, yogurt and sour cream cannot be used at high temperatures (like Crème Fraiche) since they are prone to separating. If you make this substitution, make sure the soup it is slightly cooled when served. This entry was posted in Foodies and tagged Apple wood bacon, carcinogenic, Casserole, caviar, chicken stock, chives, collard greens, Crème Fraiche, envy, holiday, low in fat, marshmallows, nutmeg, Oregano, Pork, Potassium, prohibitionists, Religion, Smoky, sweet potato pie, sweet potatoes, uncured, Uncured bacon, Vitamin A, water soluble fiber, yams. Bookmark the permalink.